The Green Girl and Lexa were professionally fitted on Sunday by Coach Steve from Tri This Coaching. 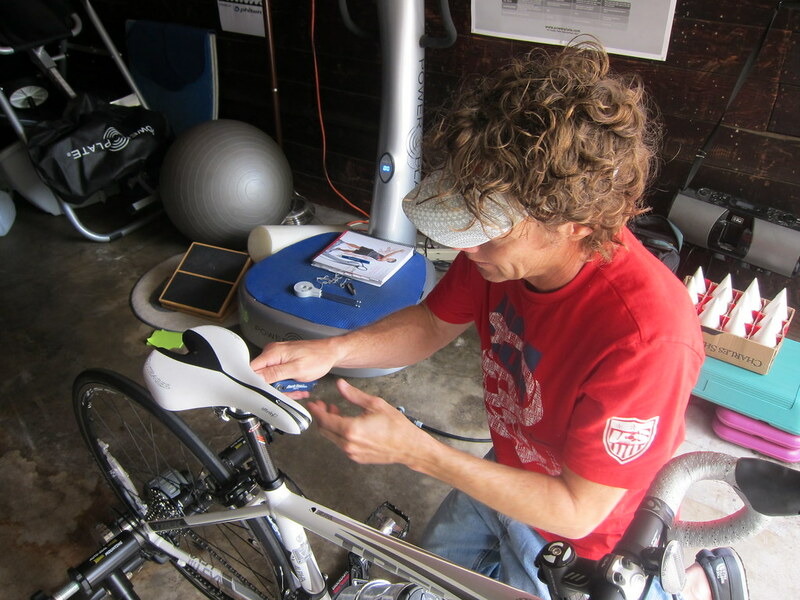 In addition to being the Sole Runners' head coach, he's also a USA Cycling Coach and USA Triathlon Coach. The first thing he did was check Lexa's tire pressure. He told me both tires had less than 10 pounds. I explained I had tried to check her air pressure a few times but I couldn't figure out how to do it. 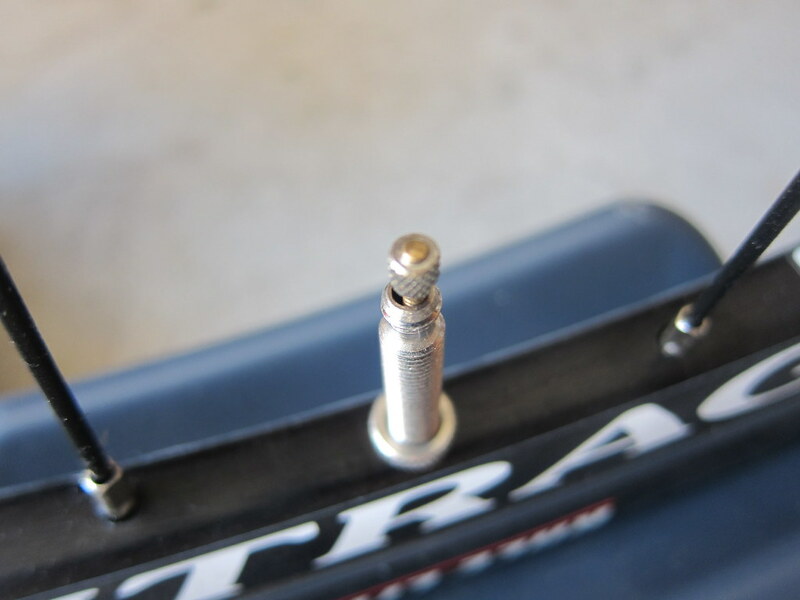 Turns out Lexa's tires have Presta valves which have an additional small nut which needs to be unscrewed before pumping can take place. Coach Steve showed me how to check the pressure and pump the air. Once Lexa's tires were pleasantly plump again, he put mounted her up on the trainer. 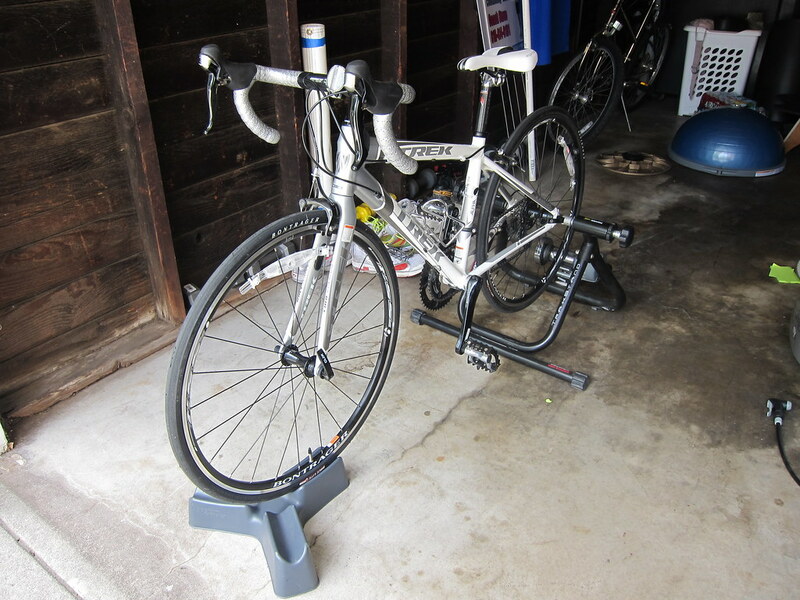 Because she has 650c wheels, she was almost too small for the trainer. Coach Steve had me get on Lexa and start pedaling. Then, he had me stop with the cranks at 3 and 9 o'clock. He dropped a plumb bob to see if my patella was directly over the end of the crank. It was not properly aligned so he had me get off the bike. The process consisted of Coach Steve making incremental adjustments and then me getting back on to pedal again so he could see how it looked. Coach Steve used a goniometer to measure the angle of my knee flexion. He suggested I change my foot placement to prepare myself for clip-ins. I told him I had my doubts about the whole clip-in idea but he reassured me I would be fine. 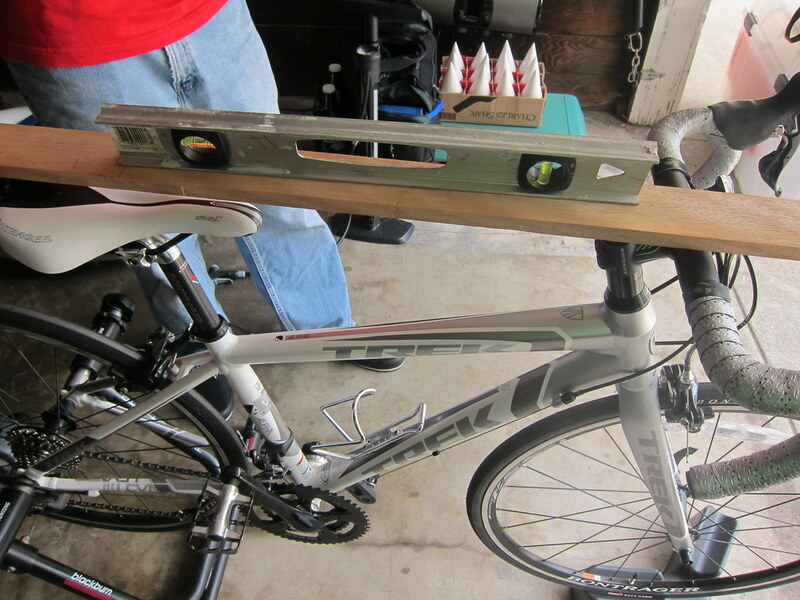 Coach Steve said I actually did a good job with the saddle height but he also adjusted the angle and the fore-aft. In terms of the handlebars, he explained lowered handlebars provide an increased forwarding-leaning, more aerodynamic ride, to a point. To avoid putting too much strain on my back, shoulders or wrists, at this point, he left the handlebars higher up for now. He also rotated them slightly to make it easier for me to keep my hands on the hoods. He mentioned he could also adjust the brake lever positioning in the future when I replace Lexa's handlebar wraps for a set of green ones. As he was going through the entire process, he went over each of Lexa's parts in detail so I would understand how she works. He also went over shifting gears while Lexa was still up on the trainer. Once I felt comfortable changing gears, we headed out for my first cycling lesson. He began with the proper technique for starting off. He also had me practice rolling with only one foot on a pedal. Once I'd mastered that, he showed me how to do turns and taught me to coast and stand up with the pedals at 3 and 9 o'clock. He had me look behind me while trying to maintain a straight line. He gave me pointers on cycling in traffic and then he ran next to me while he had me practice what I'd just learned. When I'd gained some confidence riding Lexa, he brought out his bike and we went for a short ride together. He made me feel extremely comfortable because he communicated exactly what I should be doing at all times. I was so appreciative of Coach Steve's patience with me and after my fitting and lesson, I'm feeling a little better about riding on roads with Lexa. Bike fits are so beneficial! I got one last year, and am so glad I did. I am waiting for a tune up right now! I think somebody is trying to tell me something, like go for a bike fitting. I keep bumping into post about it and after my last ride my back was killing me. Cool post! Loads of really detailed info. I'm sure it will make a huge difference on your rides. Attention to detail and I'm sure it will benefit you a great lot. Enjoy your training time with Lexa! A good fitting makes a world of difference. Not that you need to be spending more money, but I can't wait to see the new green bar tape! Coach Steve sounds pretty awesome. Never knew how many adjustments bikes needed. 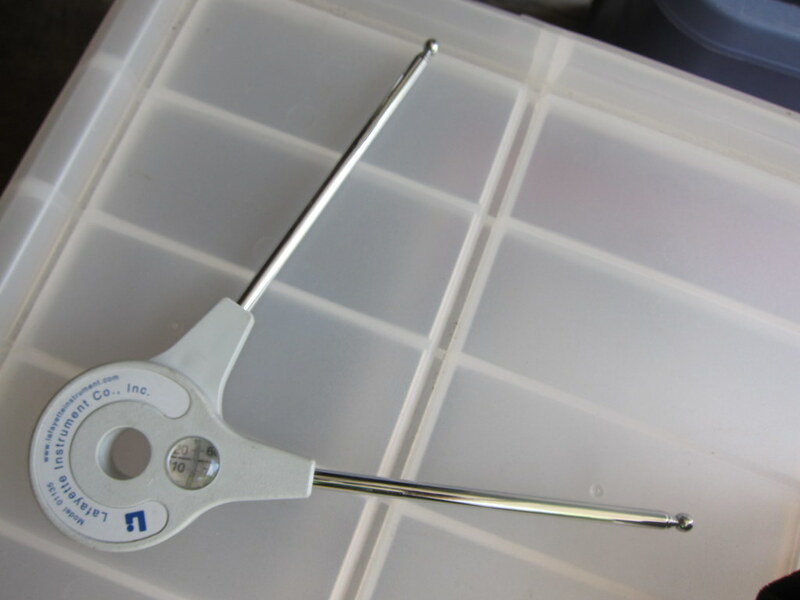 You lost me at "Coach Steve used a goniometer to measure the angle of my knee flexion", but even that sounds cool. Good luck with the cycling. Sure is a good looking ride. Lexa will reward you for getting her fit by a pro! Glad you got some road cycling 101. Be safe and have fun!